Vauxhall is encouraging customers to buy in March from its best-selling range of passenger cars to avoid next month’s Vehicle Excise Duty (VED) increase. The updated road tax measures will provide a big shake-up of the existing system, with the revision of the vehicle tax bands affecting everyone buying a new car from April 2017 onwards. Big savings can be made across the award-winning Vauxhall range if you buy now before the new rules come in to force. Based on four years of ownership, the Corsa SRi 1.0i Turbo (90PS) Start/Stop ecoFLEX in three-door hatch body style will go from £60 (zero VED in the first year, subsequent years at £20 standard rate) under the current regulations to £560 on the 1st April. If you’re in the market for one of the best compact family cars on the market, the Astra SRi 1.0i Turbo (105PS) Start/Stop ecoFLEX in five-door hatch body style sees a VED hike of £500, where you would pay £60 under current VED regulations. 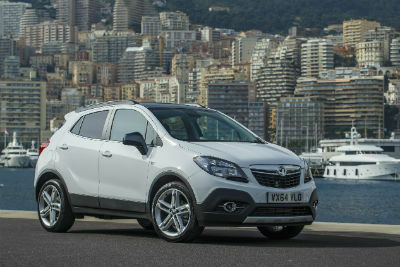 For customers looking for a compact SUV, the new regulations mean a Mokka X Active 1.6 CDTi (110PS) Start/Stop ecoFLEX FWD model will see VED increase by £500 to £560. These savings are in addition to Vauxhall’s Sales Event which runs 17th to 21st March 2017, where you can get that new Vauxhall you’ve always wanted plus a great deal more. As well as beating the taxman, you can get £500* spending money and 20 per cent off genuine Vauxhall accessories**. And that’s on top of our already great offers already available. All figures based on VED costs over four years of ownership. * Participating Retailers only. £500 spending money not available on VIVA, Corsa Sting, Corsa Sting R and Corsa Diamond. £500 spending money given as pre-paid debit card and is not given in cash. Your Card is issued by R. Raphael & Sons plc pursuant to license by MasterCard International Incorporated. MasterCard is a registered trademark of MasterCard International Inc. R. Raphael & Sons plc is a UK bank authorised by the Prudential Regulation Authority and regulated by the Financial Conduct Authority and the Prudential Regulation Authority (registration number 161302) and is permitted to issue e-money. Head office and registered office at 19-21 Shaftesbury Avenue, London W1D 7ED, company registration number 01288938. Spending money available on eligible, selected new vehicle orders from 17th-21st March 2017 and registered by 31st March 2017. ** Prices do not include fitting or painting. Prices include VAT. Accessories must be purchased between 17th-21st March 2017. Accessories must be ordered by Retailer at the time of new car order. Online orders are excluded from the offer. General Motors UK Limited t/a Vauxhall Motors reserves the right to change, amend or withdraw this offer at any point in time. Savings of up to £500 available by beating the VED increase on April 1st on eligible, selected new vehicles registered by 31st March 2017. Offer applies to private individuals, Vauxhall Partners and small businesses 1-24 units. All other customers are excluded. Terms, conditions and exclusions apply. Refer to vauxhall.co.uk/salesevent or contact your local retailer for details.